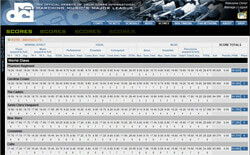 View a complete recap of scores from this event. As a reminder: When reading about the recaps, please be aware that General Effect (GE) Visual and GE Music are the only two captions that are not divided in half prior to their addition to the final score. When listing those other caption scores, the undivided score is presented first, followed by a slash and the divided score that is added to the total score for each corps. This was the third competition weekend that used an 11-person judging panel, with the addition of an additional judge on both Visual Effect and Music Effect. Only half the DCI World Class corps were in competition at this show. The other half competed on Friday, Aug. 1. This is the last show where many of these corps will meet prior to the World Championship Quarterfinals. Read the recap analysis from Allentown on Friday. While the big news from the Friday night show in Allentown was one corps' undefeated streak being broken, the big news Saturday night was how close the top scores of the corps heading into the World Championships are. Usually, one can't precisely compare scores from one night with scores from another night. However, the judging panel in Allentown was the same both nights and the judges judged both nights as if it was one show. It's pretty exciting to see how close the scores of the Cavaliers and Blue Devils from Friday night are to Phantom Regiment and Carolina Crown from Saturday night. Considering that the Cavaliers scored a 95.900 on Friday and Blue Devils finished only 0.25 behind with a 95.650, Phantom Regiment's 1st place score Saturday of 95.825 and Carolina Crown's score (also from Saturday) of 95.400 gives a current spread between the top four corps' highest scores thus far of just 0.50. Phantom Regiment (1st, 95.825) won four of the eight captions, taking Effect Music, Visual Ensemble, Music Ensemble and Percussion, the latter by a spread of 0.65/0.375 over Carolina Crown. While Crown took half the number of captions, the fact that Phantom placed 3rd in Effect Visual (0.30 down to the Cadets and 0.25 down to Crown) and 3rd in Brass (0.40/0.20 down to Crown) kept things close between the two top corps. The corps was a very close 2nd in Visual Performance; just 0.10/0.05 down to Crown, and was 0.20/0.10 down to the Cadets in Color Guard for 2nd place in that caption. Phantom Regiment tied Carolina Crown for total Effect, and was 1st in total Visual despite taking just one of the three Visual captions, and was 1st in total Music, 0.275 over Crown. Carolina Crown (2nd, 95.400) tied for 1st in total Effect despite being 2nd in both Effect captions. The corps took 1st in Visual Performance and Brass, the latter by 0.40/0.20 over Phantom Regiment's 3rd place Brass score. Crown's Color Guard was 3rd, 0.30/0.15 down to the Cadets and 0.10/0.05 down to Phantom. Despite taking 3rd in total Visual, with 3rd place finishes in both Visual Ensemble and Color Guard, the corps was still just 0.15 down to Phantom's top score in total Visual. The corps was 2nd in both Effect captions, Music Ensemble and Percussion. The Brass score helped mute the 0.65/0.375 deficit to Phantom in Percussion so that Crown finished 2nd in total Music, just 0.275 down to the Rockford corps. The Cadets (3rd, 94.350) took Effect Visual by the smallest margin possible (0.05 over Crown) and also won the Color Guard caption by 0.20/0.10 over Phantom. The gap in Effect Music, which saw the corps in 3rd, 0.80 down to Phantom and 0.55 down to Crown, accounted for much of the deficit to the two top corps. The Cadets were also 3rd in Percussion, 0.60/0.30 down to Crown and 1.25/0.0625 under Phantom. All other captions finished in 2nd. Santa Clara Vanguard (4th, 91.700) was 4th in every caption. The corps was a full 1.2 under the Cadets in total Effect, 0.80 down to the Cadets' 3rd place finish in total Visual and 0.650 down to the Cadets in total Music. Blue Stars (5th, 87.250) were 5th in every caption except Visual Ensemble, in which the corps placed 7th. Although the corps tied in Effect Visual, the corps' spread of 1.875 spread over the Crossmen in total score was largely due to the having a 1.10 advantage in Effect Music. Crossmen (6th, 85.375) took 5th in Visual Ensemble and tied for 5th in Effect Visual. They took 6th in Effect Music, Visual Performance, Color Guard and Brass. The corps finished 7th in Music Ensemble and Percussion. Colts (7th, 83.650) were 8th in Percussion and 6th or 7th in everything else. About half the 1.725 spread between the corps and the Crossmen was due to a 0.875 deficit to the Crossmen in total Music, with total Effect and total Visual sharing almost equal portions of the remaining spread. Spirit (8th, 83.450) was 6th in Percussion, just 0.30/0.15 under the Blue Stars line, 7th in Brass and 8th in all other captions, though one of the two Effect Music judges had the corps in 5th. Pacific Crest (9th, 79.275) was 9th in every caption. Pioneer (10th, 74.000) was 10th in every caption. The following is a list of the scores each of the Drum Corps International World Class Corps received at the DCI Eastern Classic in Allentown. Since the judging panel was the same both nights and both nights were judged as if one show, a direct comparison between corps can be made. 1. 95.900 The Cavaliers (1st-Friday) 2. 95.825 Phantom Regiment (1st-Saturday) 3. 95.650 Blue Devils (2nd-Friday) 4. 95.400 Carolina Crown (2nd-Saturday) 5. 94.350 The Cadets (3rd-Saturday) 6. 91.700 Santa Clara Vanguard (4th-Saturday) 7. 90.800 Bluecoats (3rd-Friday) 8. 87.250 Blue Stars (5th-Saturday) 9. 86.650 Glassmen (4th-Friday) 10. 86.325 Boston Crusaders (5th-Friday) 11. 86.200 Blue Knights (6th-Friday) 12. 85.375 Crossmen (6th-Saturday) 13. 84.425 Madison Scouts (7th-Friday) 14. 83.650 Colts (7th-Saturday) 15. 83.450 Spirit (8th-Saturday) 16. 80.075 Troopers (8th-Friday) 17. 79.275 Pacific Crest (9th-Saturday) 18. 78.025 The Academy (9th-Friday) 19. 77.600 Mandarins (10th-Friday) 20. 74.000 Pioneer (10th-Saturday). The scores from Allentown in conjunction with those received throughout the season at other Drum Corps International Premier Events have been averaged to determine the order of appearance at Thursday's World Class World Championship Quarterfinals. View the Quarterfinals lineup.